Many people ask is believing in yourself biblical? The answer is no. It’s the worst advice someone can give you. Scripture makes it clear that apart from Christ, you can do nothing. I recommend you to stop believing in yourself. It will only lead to failure and pride. If God tells you to do something, He doesn’t expect you to do it on your own. If He doesn’t make a way His purpose will not be accomplished. I used to believe in myself and I will tell you how. God gave me a promise and He revealed His will to me. One day I would read Scripture, pray, evangelize, and basically it was a good day. I was trusting in myself so my thinking was that God is going to bless me and continue in His promise because I have been good. The next day I probably didn’t read Scripture like I should have, maybe an ungodly thought popped up in my head, I didn’t evangelize so basically I struggled that day. Now my mindset is that God will not help me because I didn’t do good today. My joy was coming from myself, which led to feeling condemned. Our joy should always come from the perfect merit of Jesus Christ. When you’re going through trials don’t listen when someone says, “believe in yourself.” No, trust in the Lord! He promised He would help us in times of adversity. Scripture never says find strength in yourself, because self is weak, self is sinful. God says, “I’ll be your strength.” If you’re saved you’re not saved because you believed in yourself or the good things you have done. If you are saved it is only because you have trusted in Christ alone for salvation. 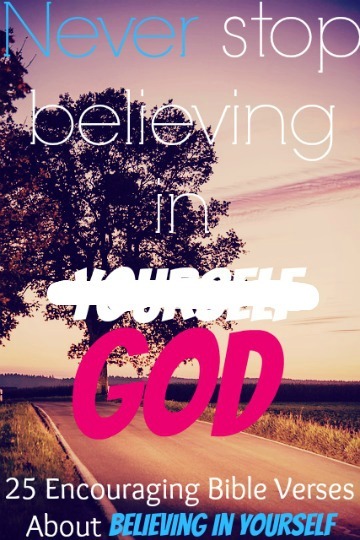 Believing in yourself leads to sin. You start to think you are better than you really are. You start to think I can manage life on my own. Faith in what Christ did for you on the cross leads to a change of life. God promises to make His children more like Christ. When going through tough times are you going to pray to yourself for help or are you going to pray to the Lord? He is the only one that can help you. When you find yourself struggling with sin are you going to say, “I’m just going to try a little harder” or are you going to pray to the Holy Spirit for help and strength? On my own I can do nothing, but my omnipotent God can. 1. Proverbs 28:26 Whoever trusts in his own mind is a fool, but he who walks in wisdom will be delivered. 2. Proverbs 12:15 The way of a fool is right in his own eyes: but he that hearkeneth unto counsel is wise. 3. John 15:5 I am the vine, ye are the branches: He that abideth in me, and I in him, the same bringeth forth much fruit: for without me ye can do nothing. 5. Isaiah 64:6 But we are all as an unclean thing, and all our righteousnesses are as filthy rags; and we all do fade as a leaf; and our iniquities, like the wind, have taken us away. Trust in the Lord instead. 6. 2 Corinthians 1:9 In fact, we expected to die. But as a result, we stopped relying on ourselves and learned to rely only on God, who raises the dead. 7. Proverbs 3:26 For the Lord will be your confidence and will keep your foot from being caught. 8. Proverbs 3:5-6 Trust in the Lord with all your heart, and do not rely on your own understanding; think about Him in all your ways, and He will guide you on the right paths. With the Lord’s strength, (not your own) you can do and overcome anything. 9. Psalm 18:32-34 the God who equipped me with strength and made my way blameless. He made my feet like the feet of a deer and set me secure on the heights. He trains my hands for war, so that my arms can bend a bow of bronze. 10. Exodus 15:2-3 The LORD is my strength and song, and he is become my salvation: he is my God, and I will prepare him an habitation; my father’s God, and I will exalt him. The LORD is a man of war: the LORD is his name. 11. Philippians 4:13 I can do all things through him who strengthens me. 12. Psalm 28:7 The Lord is my strength and my shield; in him my heart trusts, and I am helped; my heart exults, and with my song I give thanks to him. 13. 1 Chronicles 16:11 Search for the LORD and for his strength; continually seek him. 14. Ephesians 6:10 Finally, my brethren, be strong in the Lord, and in the power of his might. When doing God’s will we can’t guide ourselves. 15. Proverbs 20:24 A person’s steps are directed by the LORD. How then can anyone understand their own way? 16. Proverbs 19:21 Many are the plans in a person’s heart, but it is the LORD’s purpose that prevails. 17. Jeremiah 10:23 O LORD, I know that the way of man is not in himself: it is not in man that walketh to direct his steps. 18. Proverbs 16:1 We can make our own plans, but the LORD gives the right answer. 19. Deuteronomy 31:6 Be strong and of a good courage, fear not, nor be afraid of them: for the LORD thy God, he it is that doth go with thee; he will not fail thee, nor forsake thee. 20. Isaiah 41:10 Fear not, for I am with you; be not dismayed, for I am your God; I will strengthen you, I will help you, I will uphold you with my righteous right hand. 21. Hebrews 13:6 So that we may boldly say, The Lord is my helper, and I will not fear what man shall do unto me. Nothing is impossible for God, so use His strength. 22. Jeremiah 32:27 Behold, I am the LORD, the God of all flesh: is there any thing too hard for me? 24. Job 42:1-2 Then Job replied to the Lord: “I know that you can do anything, and no one can stop you. 25. 2 Timothy 1:7 For God gave us a spirit not of fear but of power and love and self-control.